My “blog-sumer” Miele washing machine cheat sheet — a user guide with opinions and tips for best results. Earlier this year, Mr. AM accidentally knocked over a drip filter cone of hot espresso coffee that was brewing on the counter. The scalding liquid and fine grounds splattered all over the front of his chinos. 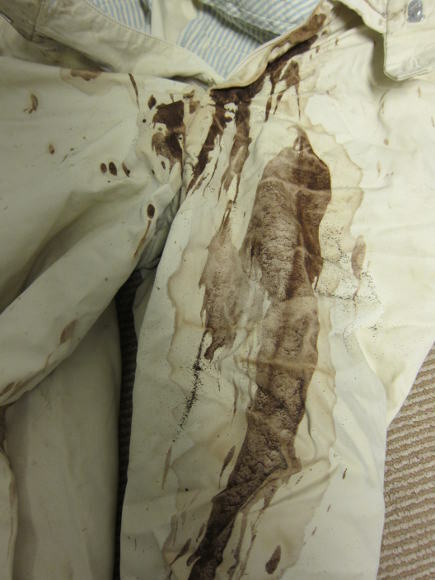 Fortunately he wasn’t burned but the spill was so bad he had to remove his pants in the laundry room. I forgot about them for a few days and when I recovered, they looked destined for the cutter pile. But I had recently purchased a Miele washing machine (3035) and dryer, an investment in making life easier when my 9 year-old washer failed. I felt pretty sure I would get the stains out. The Mieles are basically electronic laundry robots with their own program tree. This is not your Mom’s washer. The manufacturer’s instruction book is unfortunately vague and disorganized. Water temperatures are in Celsius (not so useful in the U.S.). Plus there are annoying errors as it doesn’t appear the book gets updated even when machines do. I’m a quick study but, initially, I wasn’t finding it easy to use the machine. Before buying the pair I had sought advice from Tina Amyes, a British-born PhD in enzymology, who I’d connected with on Gardenweb. Tina has been using her machine for about a year and is as particular about her laundry routine as I am. Not only did she encourage me initially to purchase the Miele washing machine over another brand I was considering, she patiently answered all my questions. Her command of the machine — including quirks of the various cycles, water levels, agitation, and reliability of wash temperatures — was amazing. And her experience and precise approach gave me a grasp of how to go about my laundry tasks. That’s how this Miele washing machine cheat sheet (it might also be called a user guide) began. Mr. AM’s chinos were saturated with coffee. I put ½ tablespoon of OxiClean into the prewash cup, 1 tablespoon of Persil Megaperls white detergent into the wash cup, selected the Sanitize cycle, hot water and pressed Start. Two and a half hours later, the pants emerged with no trace of the spill. I was hooked. Laundry talk is wonky and crazy-clean, I know. But the manual for this machine doesn’t explain which cycles to use apart from general statements about fabric type. We felt we needed a better guide. Many cycles are adjustable. They can be modified to include a cold prewash and/or an extended wash, and/or an extra rinse and/or all three. Others are narrowly defined. Only after Tina compiled a reference chart of all the cycles, temperatures and options was I able to figure out how to wash what. First, though, I made my own water temperature reference chart and pinned it up in the laundry room. Unlike my previous machine, which used only cold water and heated it to the set temperature, the Miele washer uses cold and hot water from the taps. However, in February, my cold water is 62F; in June it is 72F — both below Miele’s Cold 86F. This is one of the machine’s quirks, and there are others (which go unmentioned in the user guide). What the User Guide Doesn’t Say but You Need to Know. • Normal and Delicate cycles don’t activate the heater in the wash cycle. Anyone who likes cold or warm water washes can make good use of Normal. But if Normal is set for Hot, the wash will only be as hot as your house’s hot water heater setting (i.e. somewhere between warm and very warm). Aside from those two, we agreed that the machine’s heater produced accurate wash temperatures when we verified informally with thermometers. 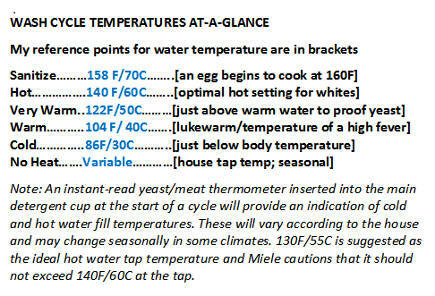 Click the photo [above] or this link for a printable copy of the Miele Wash Cycle Temperature Chart. • Heavy Soil is actually a 13-minute cold-water prewash. It is the key to all stain removal since organic (food, blood, urine etc) stains will set on fabrics washed at 120F or above. If there is doubt about stains, use Heavy Soil and a cycle that supports prewash. Heavy soil and bleach should not be used together. • For whitening, use a detergent with bleach or a powder such as OxiClean or Clorox II. These are especially effective in a prewash followed by a hot or sanitize main wash. Start with a small amount of powdered bleaching product in the first (right) detergent cup and halve the usual amount of detergent in the detergent cup to avoid over-sudsing. I don’t use chlorine bleach (i.e. Clorox) in the washer (a dispenser is provided) as liquid bleach is dispensed following the main wash.
• A Sanitize cycle with an empty machine is used for maintenance and clearing the drum of any excess suds. It is recommended to run once a month. The machine should be empty and rinse cycle water should be clear, with no suds. If suds show up in the rinse water, run a second Sanitize cycle. • Delicate is basically a cold-water soak even when Warm water is set. • This washer is designed to use very little detergent. My usual dose is 1/2 to 1 tablespoon as I have soft water. While detergent needed will vary with water quality, they way to gauge correct detergent quantity is by monitoring the suds level during the main wash cycle of a “Hot” wash. There should be bubbles or a very small amount of suds visible. If more than an inch of suds is visible during a hot wash, it’s best to cut back on the detergent dose. Everyone has a different approach to laundry. We like hot water washes, are particular about whites, sort carefully, have special-care athletic clothes and the occasional wool load. We both like warm cycles vs cold for undergarments. Both of us favor Persil detergents. I also use Persil liquid, Perwoll black wash and Perwoll wool and silk wash (all sold on Amazon.com). For stain removal I like OxiClean in the prewash though I use only 1/2 tablespoon as it produces a high level of suds in my soft hot water. Tina’s detergent library is more extensive. Tina compiled the cheat sheet as an all-in-one reference guide to every cycle. We added our notes on the cycles as well as what we used them for. Please note that minutes on the chart added for Heavy Soil, Extended and Sensitive are approximate and change according to the water temperature. Click on the image or on Atticmag’s Private Miele Washer Cheat Sheet to print out the full PDF. Disclaimer: this post is 100 percent fan-based. We received no input from Miele. Tina consulted them by phone and email to ask why the heater does not activate on Normal and Delicates cycles but has never received a complete response. I submitted a list of questions to the company to clarify issues in the user guide. Their reply was to send me a link to the online user guide. When I followed up with my questions, I received no reply. So if the company disagrees with anything in this post, they have had opportunities to respond. These are our opinions, based on our shared experiences and use. • I do towels as the first weekly load because I use fabric softener only for towels (1/2 tablespoon of Mrs. Meyers or Vernel diluted by half with cold water) and want to be sure it’s completely gone. Setting: Extra White/Very Warm/Sensitive. Alternate setting for lightly used towels: Normal/Warm/Sensitive. •My second weekly load is sheets. Also light duvet covers. Setting: Extra White/Hot/Sensitive. •White cottons and knits. 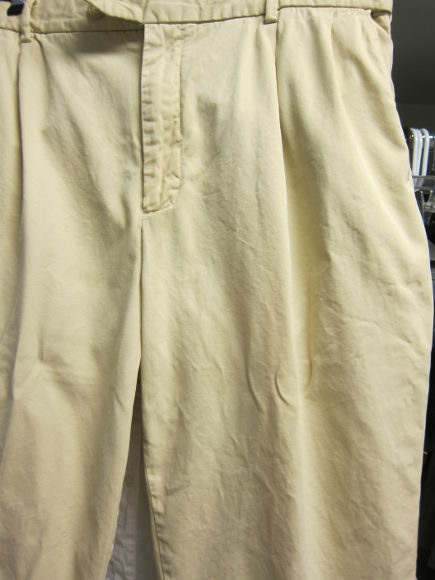 Light colored cottons. Setting: Extra White/Hot or Very Warm. •Light colored knits, t-shirts, Polo shirts, warm ups, knitted sleepwear. Setting: Wrinkle Free/Very Warm. •Black clothing. With 1/2 tb. Perwoll black wash. Setting: Wrinkle Free/Warm. •Stretchy exercise clothes. With 1/2 tb. sport wash liquid. Setting: Dress Shirts/Cold or Warm. •Lingerie. With 1/2 tb. liquid. Setting: Express/Warm or Dress Shirts/Warm. For larger loads Wrinkle-Free/Warm. •Quilts, cotton blankets, bedpads. With 1 tb. Persil Megaperls. Setting: Pillows/Very Warm or Warm. •Very soiled or stained cottons. With 1/2 tb. OxiClean in prewash cup and 1/2 to 1 tb. Persil Megaperls in wash cup. Setting: Sanitize/Hot/Extended. •Biological stains (blood, urine) or bedding during an illness. With 1/2 tb. OxiClean in prewash cup and 1/2 to 1 tb. Persil Megaperls in wash cup. Setting: Sanitize/Sanitize/Extended. •Gardening clothes. Tina likes prewash to float away the dirt and debris. Setting: Custom/Warm/Heavy Soil/Extended/Sensitive. •Household cleaning cloths/rags are always the last load so the heat in the washer will evaporate and it dries out (to avoid mold). With 1/2 tb. OxiClean in prewash cup and 1/2 to 1 tb. Tide HE (leftover) in wash cup. Setting: Extra White/Hot/Heavy Soil. If extra dirty or stained. Setting: Sanitize/Sanitize. We do not use chlorine bleach in this washer. The reason is that this machine dispenses chlorine bleach (or starch) after the wash cycle and before the final rinses. If you are a Miele fan and would like to contribute your experience to our Miele Washing Machine Cheat Sheet, we invite your comments below this post. You can comment by being logged into Google Plus, Blogger or other comment-based platforms. As we do not have children living at home, we especially welcome comments from Miele Moms on washing baby and children’s items. More more information about washing machine detergents see My Laundry Soap Test-Drive. Goodness! I will have to admit you put alot more thought/effort into your laundry than I do!! LOL Although I can’t say I really have any problems. You had a washer that ONLY did cold? I’ve never heard of such. I do many of our “good” clothing in cold or cold/warm washes. Dark colors especially. I prefer liquid detergents, but I am going to check yours out. I have not heard of many of those. I do like oxy clean. Many towels say to not use fabric softener as it affects how they absorb. Yes, I previously had a 240 v Asko washer and when the controller board went it would only do 2 hour cold washes. Needless to say this new Miele is such an improvement and also does much more. I only use fabric softener, as I said, on my towels and it’s a tiny amount diluted with water. My towels are all 800 g cotton so it’s not an issue for those. Towels with other fibers certainly would not be great with f.s. I completely agree. Glad you like your washer. At this point I’m just so happy to have one that gets it over with the right way! Good to “see” you tinam. This is such a fabulously useful post. I have your cheat sheet and it has become a gospel. However your list of what loads you do in what machine mode is terribly useful. I’ve had my machine since mid July or so but I think that I’ve never used the same settings or modes for the same load as I’ve been experimenting since it seems that there are so many modes in which one can have a Hot wash or a warm wash. Wish the manual mentioned in what way the “Wrinkle-Free” mode’s “Very Warm” is different to say the Extra-White mode’s “Very warm” setting! Anyhow, this list here is a god-send. Thanks so much for this. Glad you’re finding it useful mindstorm. I know I needed to do this for myself and felt lucky Tina was already on the same road. One obvious gap in the manual is the description of cycles. When the water temps are the same, the variables are agitation pattern, frequency and speed plus water level. I think of Wrinkle Free to be my knits/permanent press cycle. My observation is medium water level and normal rhythm whereas Extra White (my workhorse) has meidium-low water level and more intense rhythm. Tina had searched out the UK user guide which has more description of water level, agitation and number of rinses in chart form. However, the cycle names don’t correspond with our machines and that lists a few more cycles than we have. If we could get that info sorted, it could be added in. Unfortunately, I don’t find Miele wanting to be bothered with questions about using the washer. So perhaps folks will contribute their usage here on the comments as they go. I need to make more calls. Your chart with temperatures was a blessing. I need the information for other reasons (recently stayed at a very nice hotel that unfortunately had bedbugs) and the process of laundering clothing so that I can insure I’m not bringing them home is an arduous one. Knowing the temperature of the wash cycle is helping me determine which things can be processed at home using my Miele W3033 for which I am very grateful. Not to be ungrateful or a pest I was wondering if you or someone you know had similar information for the dryers (in my case specifically the T8002, 3 or 5). This info would be of huge assistance for those items that cannot be washed but could be put in a dryer that reached the right temperature to kill any insects that may be lurking. Thank you for any assistance you can provide. Glad the washer chart was helpful. Wish I could advise on using the dryer for the issue at hand. Personally, I would take those things to a neighborhood laundromat where they have those monster dryers that are like blast furnaces and will get clothes almost too hot to touch. For $3-4 problem solved. Reason I suggest that is that the Miele dryers have sensors that gauge the humidity in the clothes. So heating up already dry clothes in there isn’t in line with the way the Miele dryer works. Thank you for your assistance — I really appreciate the input. So glad the Cheat Sheet is helping. I use it every week. Re the dryer: it does not turn off automatically. I am assured the lights use very little power. But manual turn off is normal. (My Bosch worked the same way. I find it very annoying and wish it turned itself off completely especially as I frequently put a load of wash into the dryer and head to bed). Thanks for stopping by. Hope you’ll return and add to the observations here as you use the machines. I have no idea why Miele gives so little information about using the washer to its American audience. However, I recently found some useful information on Fabric Care for the machine on the Miele Australia website. It is organized by type of fiber (intelligent!) and our temperature sheet can be used to translate Celsius temperatures to Fahrenheit at a glance. Jane. I was researching washer/dryers and have been agonizing Bosch vs Miele. Then I found the gardenweb thread that lead (to my surprise and delight) here!! Your cheat sheet is unbelievably valuable, even to someone who is still in the thinking about it stage. But our space is limited and thus, so are the options. No thanks needed. Oh, have I ever been through that conundrum. All I can say is that either one is a good choice. They are a bit different but, honestly, I liked both sets. Had to leave the Bosch behind when we moved from our apartment. If you’re going with Miele, the cheat sheet is so helpful. I was lucky to have Tina to help me through the initial phases (pre-cheat sheet). I’m a quick study but it’s just not obvious. But once you get it, it’s a breeze. Good luck with your search and let us know where you wind up! Great job with the cheat sheet and this blog here. We are currently thinking about buying the W3037 as a replacement for our old top loader. So I was studying the installation manual for the W3037 and came across an interesting fact. Did you know that the machine can be installed with a “cold water only connection”? You have to change some settings in the machine, but then it should operate on a cold water source. I didn’t know that was an option with the washer though my dishwasher is hooked up to cold. 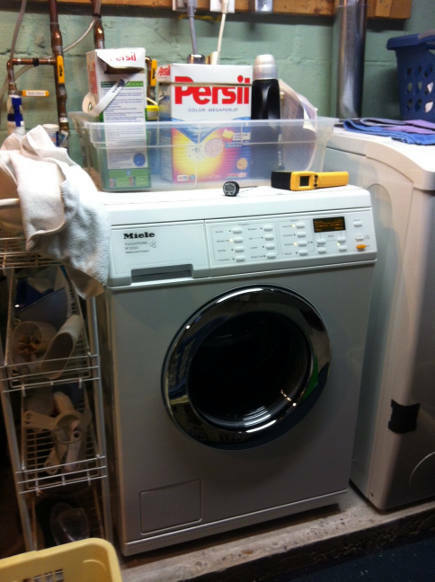 Before the Miele I had a 240V Asko that was a cold-water only installation. It required a 240V outlet for the heater in my laundry room. My understanding is, also, that older Miele machines also worked off 240v and fully functioned off the heater. No idea why or when that changed but when I bought my 3035 it needed a standard US household 120 v outlet — I had to have one put in before the machine was delivered. The salesman expressly told me, also, that I needed the hot water intake for the Miele (I wasn’t sure that had been hooked up for the Asko but fortunately it was there) . In my 2 conversations with Miele tech I queried the cold water temperature issue because mine varies wildly and is always below 86F. I was told the hot house water is used to blend with cold to bring it up to the 86F temperature just for the cold cycle. So it seems odd that there would be a cold-water only hookup option. There may be an explanation or it could simply be ‘failure to update.’ I can tell you there are some ridiculous errors in the User Guide so nothing would surprise me in the Installation manual. The only way I know to get a straight answer is to ask the marketing guys at one of the home shows or someone in the NYC showroom. . Otherwise, you get a lot of different answers when you call, as I noted in my post. That’s not to ding Miele service or quality. I have their dishwasher, oven, the washer/dryer and the rotary iron. None have ever needed service and my dishwasher is 10 years old. I’ve owned the Asko, Bosch and now Miele pair. I can tell you if you’re going for the 3037 that IME it’s best of the lot. I’m glad I bought it. And I could never go back to a top loader. But having used it now for over a year, I can’t see it working well without the hot water intake, which is used on so many settings. The workhorse programs (at least for me) are Extra White, Sanitize and Wrinkle Free. I could easily do without Normal at all. But if you go with a cold water hook up and get the settings tweaked, I’d love to hear about it and so would Tina, I’m sure. So please post and add your experience. First of all, thank you so much for the cheat sheet! I am looking to purchase the W3037 (after THREE YEARS without a washer I’ve reached the point where I just want the best one out there), and it has been incredibly helpful. However, I have to disagree with you about the cold water hookup being inefficient. I’m from Europe, and that’s the standard way European appliances function – they do not connect to hot water period. And with Miele being a German company I’d have to assume that the cold water only hookup is actually the intended way of setting up the washer, with the hot water hookup added as a customization for North America. I feel you may have misunderstood something I said about the cold water hook up. My former Asko washer had it and did an amazing job of heating the water — even up to a few degrees below boiling. I would much prefer this with the Miele and my understanding is that their older machines were cold-water only. But for machines sold in the US now, the hook up required is cold and hot water. A complicating factor is, that on both the Normal and Delicate cycles in the Miele, the heater does not engage. Hot water is house-temperature, not machine temperature. Otherwise, the heater works beautifully. Good luck with your machine! I am completely depending on mine and it does a wonderful job, as yours will. I also think they actually changed this feature for the W3037 – if you look at page 47 of the instruction manual it has detailed instructions on how to enable cold water only hookup (with a graphic of how to program via the menu). I also just got off the phone with Miele USA CS who confirmed that it was an active feature in the 3037 and not outdated info left over from previous versions. My machine (just a year old now) a 3035 and Tina’s is a 3033. Both required cold and hot. It blends those for warm settings. So we are both dealing with that. What’s more the heater does not engage to produce warm or hot water on the 2 settings I previously mentioned. If the 3037 has a change that allows the cold-water-only hookup I wonder how they do it on a 110 volt installation? Previously, a 240 v plug was previously required. But that’s great and I would love to hear how that one differs. I have a friend who bought 3037 so I will inquire with her as to how hers is hooked up. My Asko worked that way and the water temperatures were very accurate. However, I asked Miele the differences in the 3037 as it came out just a few months after my purchase. They never mentioned that feature. Unfortunately, there are so many errors in the instruction manual I have, I learned to trust my experience more. But it will be interesting to see what your observations are when you actually are using the machine. I know, it has been so confusing. If I’m spending so much money on a washer, just please make it a little easier, Miele! I went back to the 3033 and 3035 manuals, and they both featured a part on cold water only hookup, but neither had the graphic or part about setting the machine for cold water only… That kind of gives me some faint hope that it is actually fresh and actual information on the 3037, but I’ll have to double check with the dealer and try it myself at the showroom if they’ll let me. If that’s the case it’s ironic since the complaint about the Miele washer has been that it’s a 110v not 220 v machine and that it cannot have a cold-water only hookup since the higher voltage is needed for the heater. Presuming that’s correct, I’d want to hear an explanation from them about how a program can make a difference if, in fact, it is a 110 v hookup and not 220v. So the question is: does it plug into a regular outlet or does it need a special 3-prong outlet like the one I had for my Asko. But I can tell you that I came from a 220v Asko that had cold water hookup only to this Miele. And even with not having cold-water-only hookup it is a superior machine. Tina did some water testing and so did I and the temperatures were pretty accurate. So practically speaking all this may be a distinction without a difference. I wouldn’t let it stop me from going forward. 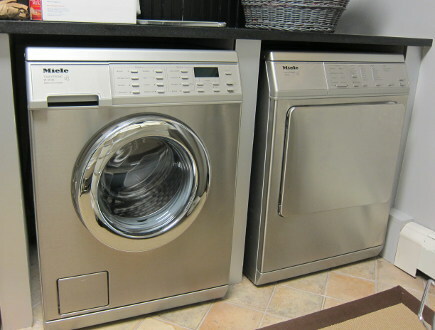 My lovely laundry is finally done and I am the thrilled owner of a 3037 and T8023C. Just one word…amazing! To answer some of the questions for above, my 3037 required a hot and cold hookup. The power was 120v for the washer and 240 for the dryer. 1. How well my clothes are being washed. Even workout clothes that had been previously washed in the special athletic fabric wash and were still not coming really clean, have been resurrected after one run through the Miele. 2. The capacity of the washer was one thing I had minor concerns about as I have a lot of slip-covered furniture. (A necessity with two Golden Retrievers!) after reading some reviews complaining about capacity I had resigned myself to finding a laundromat for the slipcovers. To my utter delight, the 3037 cleaned them without issue. I did break it into 2 loads….the first being the covers for the seat cushion and back cushion, and the second load to wash the part that covers the rest of the sofa frame. But it’s an 84 inch sofa and the covers are heavy linen, so I don’t think 2 loads is unreasonable. Even covered in mud (courtesy of the dogs) my white linen slipcovers came out brilliantly clean just from using the regular cycle, adjusted for heavy soil and an extended wash. Similarly, the dryer did it’s job perfectly. 3. The sheer, luxurious pleasure of doing my laundry in an attractive space. The washer and dryer have been relocated from the deep, dark recesses of the basement and put in a 2×6 foot closet and under a skylight. I took off the doors, placed the dryer side by side, spanned the entire width of the new nook with a walnut counter and ran white subway tile up to the ceiling. Form and function….ahhhh, bliss. So, many thanks to you Jane. All your information about the Miele’s has been invaluable and of course, Atticmag provided much visual inspiration to create my own dream laundry nook. Oh Nan, heartiest congratulations. So glad you are liking the Miele pair as much as I do. And it only gets better! As you observed, clothes actually improve. I found the same thing. Re the linen slipcovers, I have the same size couch plus the couch is slipcovered. It’s indigo and the dye is not stable. But the Miele has done them beautifully now twice. I do the whole couch cover in one load and then the bottom and top pillow covers (3 each) separately. And regular is a perfect cycle for those. Jane, I just wanted to thank the both of you for this awesome guide. I finally got my new W3038, and without the cheat sheet and your preferred cycles I would have been completely lost (and most likely just defaulting to Normal). Congrats on your machine. Glad you’re off to an easy start. I ignored the dryer for so long but think I’ve finally mastered it. I did do a down coat and trying to remember what I used. Think I did fluff first, then Wrinkle Free with dryer balls. Wool is as amazing on the dryer as it is on the washer. I was actually able to partially dry wool and cashmere sweaters without any shrinkage or issue. I agree the cycle names are idiotic. I don’t know what they are thinking but their user manuals are abysmal. For me, sturdy would be jeans and thick things. Can’t recall I used it, however. This past week I washed our quilted Sferra blanket cover. It’s one of those that has the tiny diamond pattern and I always worry about puckering — that it won’t lie flat. It cannot be ironed. Just put it in on Normal and it came out 95% dry. I let it sit out overnight and it’s perfect. I use Smooth for my yoga and workout things, usually. And other synthetics. Use wrinkle free for the cotton knits, T shirts, Dh’s sox and things like warm up pants. I don’t love the way the sheets get balled up in this dryer, I must say. That’s a huge pain. But I do get excellent results. The one huge convenience is being able to set the drying level for anything that needs ironing. I have the rotary iron and was able to rinse and re-dry a set of sheets just to the right point for that. Thanks so much for sharing your dryer experience, I’m definitely adding that info to my cheat sheet pile! I think I have yet to start really loving the dryer. I certainly like it, but at this point I’m not as starry eyed about it as the washer, if you know what I mean. Maybe because the very first load I did on Normal came out super wrinkled? Can’t remember which settings I used, probably Normal and one of the “extra dry” settings, so that was a lesson learned – now I stick to Wrinkle Free as much as possible. As for the manual, I can’t believe they didn’t have some sort of chart showing which setting to use for the standard care labels – I mean, if it says Tumble Dry Low, like my down jacket, what exactly would that correspond to?.. But in the end I played around with it, and ended up sticking with Fluff and the 45 mins/Gentle. The moisture sensor seemed a little confused – once the outer shell was dry it kept ending the Wrinkle Free/Woolens/etc. cycles, even though the down inside was still balled up, so a couple of the timed 45 min runs did the job. By the way, I am so impressed with the combination of the washer and MieleCare Down Wash! I had a long white down jacket that I had worn for two seasons without washing, and I was pretty sure it was beyond help. I didn’t even bother pretreating anything, since it looked too far gone. And yet it came out looking spotless with two very faint tiny marks left from what looked like a big coffee spill on the front (no idea how I didn’t notice that one before putting it away for storage…). Dabbed it with vinegar, let sit in the sun for a couple of hours, and now those are completely gone too, and the white jacket looks brand new. In any case, once again I just can’t thank you enough for the hard work of putting all that together. What an amazing reference and huge help! My daughter has very sensitive skin (eczema and the like) so we have always used a natural brand (Canadian) without scents or dyes. http://www.naturecleanliving.com/laundry_powder_0 Do you think we should try a European brand to get the most out of the machine? My daughter has to wear white polo shirts to school, and she is 5. You can imagine how they get stained! They are 50/50 (cotton and polyester). What cycle would you put them on to get them really clean and white? Christie, congrats on getting your new machines. I hope you will enjoy them them as much as I do mine. I find they make laundry chores so much easier! I don’t see why you should change the detergent that’s working well for you. It’s formulated for HE, which means its OK for front loaders. If you’re switching from a top loader you will want to scale back on how much you’re using. I’d start with 2 Tablespoons for a medium-size load and see how it goes. The amount of detergent depends somewhat on the water. You should see very low suds to just bubbles — not anything thick or very prominent — that would be a sign of too much detergent. I can post a picture of that if you need one. If you don’t think the current detergent is performing after giving it a month or so then there are a few ways to go. I’ve tried Persil Sensitive and it was OK and totally fragrance free. Miele recommends that brand as well as their own. Here is a link to the Miele store that shows the detergent they recommend. I have found through trial and error that I’m partial to German laundry products. 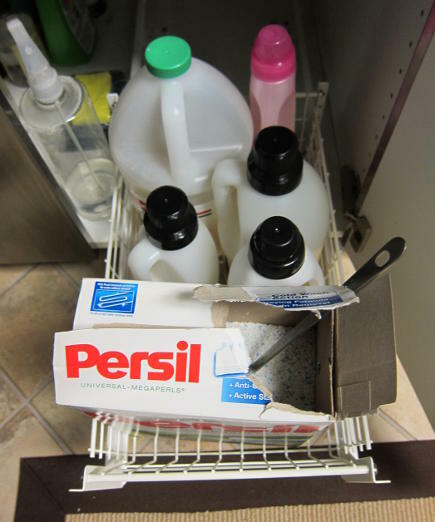 I personally use Persil megaperls and I find that nothing gets white as clean and bright. But that has optical brighteners, enzymes and fragrance. Persil sensitive doesn’t have any fragrance or brighteners. Miele also makes a Sensitive powder that may be worth a try if yours doesn’t give great results. But sounds like it should be just fine. For her school shirts I would go with the Extra White setting on Hot. Then set it for HeavySoil and Sensitive (which I just leave enabled so I always get extra rinses). With 50% poly I’d start there and see how they do. That will actually be a good test of your current detergent as it starts with a cold wash and moves to hot. I use that setting, f.ex. for my microfiber kitchen cloths which have all kinds of stains. That cycle gets those very clean. If that doesn’t do it, I’d go to Sanitize-Hot+Sensitive and see if that’s more effective. It’s a much longer cycle so it will not be quite as gentle on her shirts long term. If there are very difficult stains — you saw the espresso on my husband’s pants — then I go to Sanitize-Sanitize+Sensitive. That’s the #1 stain fighter but it’s a 2 hour + cycle that I reserve for biologic stains or if one of us has the flu. That’s not gentle on clothes as the water temp is 165F, which is simmering. No thanks required! I’m pleased the cheat sheet is helpful to you. Don’t hesitate to post more questions as you go along. But I expect you’ll get a feel for the machine quickly. Thank you so much Jane! Your information is such a huge help. I’ve been talking with my husband, and I think I am missing valuable laundry info – my mother must have kept that to herself 😉 I feel like a whole laundry world is opening up! We have hard water, but we have a water softener so I will make sure it is always full of salt and use less detergent. This is our 3rd front loader, hopefully it will last much, much, much longer than the 4 year old Samsung it is replacing. I may try the Persil and just do the Sensitive rinse (I always do an extra rinse) and see if it bothers her. I want those sparkling whites! I will report back. The table and comments are super helpful! Thank you so much for putting this information out there for everyone. I do have a question on an item not appearing so far. Which cycle/settings do you recommend using for rubber-backed bathroom rugs, soiled by organic substance and stomach acids (from cats…)? That’s a tough one. You want hot water for the organics but cool water for the rubber. If it’s a dark color you also don’t want to leech that out. I’d likely put that on Normal + Very Warm + Heavy Soil. My default stain treatment method is 1/2 Tb Oxyclean in the first wash cup and then 1/2 Tb detergent in the main wash cup. Normal has aggressive action, which I’d want and with only 1 item in there the water level isn’t an issue. Alternately, you might try Persil’s Disinfectant Rinse. Honestly, if I had pets in the house I’d invest in that. Then the warm water wash is just fine. Does this cheat sheet also help (work) with the 6065? I think your cheat sheet if fantastic. Don’t see why it wouldn’t work with the 6065. The cycles are very similar. I haven’t seen your operating manual though so the wash times could be different. But try it out and let us know. I’d love to have a report on the 6065 and how you like it. Glad you like the cheat sheet. Will be working on one for the dryer soon. I would greatly appreciate a cheat sheet. The Cheat Sheet is linked above. Perhaps you missed it. Here is a direct link so you can print it out yourself. Just click on the link. The printer should be in “landscape” mode. Thank you so much for sharing this information, I find it very helpful! I have two questions for you. I was wondering if you use the Normal cycle for anything? It would seem to be the default setting, but it doesn’t appear that you use it? Also, for “Very soiled or stained cottons” you use OxiClean in the prewash cup, but you don’t use the “Heavy Soil” option; you use “Extended”. I thought I read in the manual that if you are going to use a pre-wash, you must use the “Heavy Soil” option — the “Extended” option can be used with a little extra detergent, but not with a bleach alternative…? I use the Normal cycle for warm washes. Its OK for things like lightly soiled towels and colored clothing which dont need a prewash. I also use it for large black loads done on cold. Suppose they need to have a default for the machine. Normal doesn’t seem to do anything special. Its all purpose but I would say NOT a hot wash cycle. You are correct. I use Heavy Soil for prewashes with oxyclean in the prewah cup. I use extended occasionally. Where does it say that? If that’s the case I should make a correction. Extended just inceases the main wash time, of course. This article was very helpful, despite the fact we live in Australia, and use a very different version of the Miele washer (The W5741). – The Minimum Iron (equivalent to Wrinkle Free) is a nice cycle, but unfortunately only supports a half-load (like most of the other specialty cycles). Additionally, the greatly-boosted water level can be beneficial when you need more water pushed through your clothes to work out harder stains. – There is no bleach dispenser. Admittedly, while Miele doesn’t recommend the stuff over here, or over in the US, the fact is, washers have been used for decades with the stuff, and plenty of vintage machines are still operational today, despite being used with it (e.g. Older Maytags). With the lack of bleach dispenser, it makes it very difficult to get a short bleach phase for the clothes. If you bleach in the pre-wash, you end up killing enzymes for the profiled main-wash phase. If you use bleach during the main-wash, the pre-wash isn’t long enough, or hot enough to let the enzymes work, then you have a very long main-wash not intended for bleaching. What I’ve resorted to for the shirts that “need” bleaching is pre-rinsing them in the bath with cold water, then getting a large bucket and soaking overnight with conventional detergent, before a quick wring-out, and into the Miele. I add a tsp of detergent (since the detergent itself is still working as a cleaner, just sans-enzymes) along with about 1/2 cup of diluted bleach during the fill-phase on an Express Cycle in warm water. The results are stunning, and it helps keep the machine clean. It would be nice, however, if there was a speciality cycle or option for us Aussies, however! Those are really the only niggles. Otherwise, the washer works great, and I do enjoy the versatility it has to offer, along with great efficiency. *And, funnily enough, over 80% wash in cold water… Which makes no sense, and absolutely does not work, despite the cries of individuals and “consumer reporting” groups! 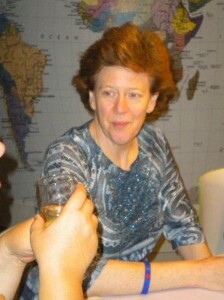 Hi Jane, this blog is great and thank you again for sharing your experiences. So far, I’ve successfully washed my husband’s silk shirts with the silk cycle, but I’m nervous about trying it with my silk scarves. They range from vintage 50s light chiffon to more recent rather stiffly woven ones, similar to Hermès carrés. Do you have some experience with scarves to safely recommend Miele silk cycle for them? I was reading while researching this topic that people have been hand washing silk for 5000 years and that actually modern dry cleaning is very hard on silk fibers…. so the question for me is hand wash or Miele wash. Thanks very much! Silk scarves can be tricky, especially vintage. I also have a lot of Hermes and have not washed any so far. I have washed my husband’s silk knit shirts in the Miele on silk and they come out fine. But they weigh enough to be a balanced load. But the big problem with washing scarves is not wrinkling them horribly when getting the water out and then pressing them. The Hermes have a hand rolled edge that you you don’t want to ever press down with a steam iron. They require professional steaming from the bottom. Some say they have washed Hermes scarves and there are methods for doing it if you google. The most sensible advice I’ve seen is to hand wash by waving the scarf through water both with the detergent and after for rinsing. Then, the smartest thing is to pull the wet scarf out straight, lay it down and use a blow dryer on low. I wouldn’t squeeze any silk scarf or roll it up in a towel. Sorry I don’t have a tested method. I may have missed it in the mass of information about washing, but do you know if you can perform a simple “soak”? My wool-wash (gentle liquid detergent) has a no-rinse instruction. I would like to soak my sweaters with no agitation, and then have the washer drain without rinsing. I haven’t figured out how to do that. I printed your guide to post in the laundry room– many thanks! The closest thing I found to soak is handwash, however that has a medium spin. I have found the wool cycle to be superb. It has completely renovated old sweaters. I trust it. One doesn’t want to take chances with favorite sweaters, so it’s good to hear the voice of experience! No worries. Just use Woolite. That’s one of my very favorite cycles. Then I usually spin them out again at higher speed so they dry very quickly. I have really old cashmere sweaters that look new again. I didn’t see it here, but I suffer from occasional willful blindness, is there any way to just run a spin cycle on these machines? Yes, I do it all the time. It’s a Master Care cycle called Drain/Spin. Provides a high-speed spin and does a great job. Hi Miele fans! I wondered if anyone had a suggestion. We were gone for a week and did not run the machine. When we got back, for the first time in the eleven months we had the machine, it smelled musty. We always leave the detergent drawer open and the main door open (after wiping seal) when not in use. I ran sanitize and the drum (that I don’t think was the problem) smelled fine. I slid the entire detergent draw out and it smelled musty deep in there. The drawer didn’t smell at all. Any ideas? There is a cleaning protocol in the Miele manual but sounds like you followed that. I would run another sanitary cycle with a cup of vinegar in the detergent drawer. If that doesn’t do it, I’d try Miele technical support. If you use fabric softener regularly I would lose and see what happens. Good luck! Hi. I want to do a COLD WASH AND RINSE. COLD ONLY NO HEAT OR HOT WATER! HELP! I am trying to use this cheat sheet and still getting hot clothes out of the washer at the end. I want to make sure it is hooked up properly. I have chosen the NO HEAT and its still super hot and steaming. Thank You. First, which setting are you using? The final rinse on all cycles is cold. It is never hot. Either a different cycle needs to be used or the hook up may be an issue. If you give more details, perhaps it can be diagnosed. I have used normal and woolens (which ended up steaming hot and shrank everything). I also can’t figure out how to do a quickwash. I love the washer but I’m super confused and can’t really understand the instructions. I have changed it over to Cold ONLY and it still is steaming! When you say “it is still steaming” do you mean the clothes come out hot at the end of the cycle? If so, first check the temperature setting of your hot water heater. Mine is 120. That’s optimal. If yours is higher, lower it. It is impossible for Woolens to be steaming hot. The hottest setting for that cycle is Warm — 105F. There is a cold rinse on all cycles. So if clothes are coming out of the machine hot then either the installation is backwards or something is very wrong with the machine. Who installed the machines? The quick wash is Express. You press the Master Care button until Express shows on the right screen and then you select that. When you say “I have changed it over to cold” what do you mean? I was confused too at first. Couldn’t figure it out! And I’m a super quick study. You will get used to it. But you need to be sure it’s hooked up right or there isn’t some gross malfunction. Have you run a Sanitize cycle with a completely empty tub? That resets it. I would do that — don’t put anything in there, just run it on empty. See how much soap is in that cycle. If there’s a lot of soap that could be an issue. These machines don’t like too much suds. Thank you so much for this! We just t a used set like yours and went to but the Persil Pearls but they seem to have been discontinued. What do you use now? Thanks again! I just got a W3048 and some of the settings shown on your cheat sheet don’t exist on this machine. On the cheat sheet there is a setting shown, Extra White, that I don’t have. Does your enzymologist friend maybe have an updated version? I’m looking for the best setting for sheets, I have sateen and flannel. I’ve googled around and can’t find any recent conversations about the newer settings. Hi Chris, I took a look at your washer’s manual. You will find Extra White under the Master Care program. Expect the programs have been moved around a bit. Here is a link to the manual online. Check page 13-14 and you can see it. That’s the program I use for sheets with hot or extra warm temperature settings.